Fig. 1. Cover of the Spanish translation of John Colton's The Shanghai Gesture. Image courtesy Archivo China España, 1800–1950. The answer transcends this one curious anecdote. In the first half of the twentieth century it was almost impossible to imagine China from the viewpoint of Spain without English, French, or German mediation. In particular, the 1920s and 1930s was a singular historical period when, for the first time in history, the image of China throughout Europe—the different ways in which it was viewed, perceived, discussed, and represented in the arts and within the public sphere—was endowed with an extreme richness and diversity due to a combination of several historical factors. A remarkable number of European intellectuals, writers, students, diplomats, workers and businessmen traveled to China and vice versa. New journalistic practices and professional reporters accelerated cross-cultural contacts and placed China in a coeval position vis-à-vis the West. The impact of the proclamation of the Republic of China in 1912 produced a significant humanization of the Chinese population. A great variety of Chinese images circulated widely through popular culture. The fact that this vast plurality of images of China reached Spain indirectly raises essential questions to be asked about the role played by the dominant European cultures in the circulation of Chinese (and Asian) representations around the world as well as about the political implications of translation in these indirect cross-cultural representations. For instance, these perceptions were framed under a colonial gaze that became extended to nations without colonial relations with China at the time. The remarkable amount of knowledge about China that reached Spain through indirect translation simultaneously connected and disconnected two cultural contexts—China and Spain—that had many historical similarities at the time. Translation was, then, a connecting bridge and also a disconnecting mechanism between cultures. In the late nineteenth and early twentieth centuries, China and Spain shared many historical predicaments. Both faced military defeats in colonial or semi-colonial contexts, saw the spread of nationalist ideas and the fall of monarchies, suffered military coups d’état and the installation of dictatorships, witnessed the proclamation of republics and were devastated by civil wars. A shared consciousness of a fin-de-siècle crisis pushed both countries to find new solutions and to negotiate beyond the boundaries of a national culture that had become inconsistent with the new world order. In Spain, these parallelisms spurred a keen interest in China. Far from the commonly held perception that sees China as an unknown, inaccessible reality, there was plenty of information about China in Spain at the time. China was a popular topic in Spanish society and culture. It was something that had to be known about. The coverage of China in Spanish newspapers and magazines during the early twentieth century did nothing but increase, with regular information about Chinese culture, society, and politics in illustrated magazines. The convulsions of the end of the Qing empire were closely followed: the Boxer Rebellion in 1900 was watched with expectancy, the fall of the Qing dynasty was promptly announced in 1911, and the political instability that caused the failure of the republican project was also systematically reported. The Spanish Civil War (1936–1939) became a crucial moment when representations of China enjoyed particular prominence in Spain—especially in Republican territories such as Catalonia. After 1937 the coexistence of the Chinese resistance against Japan and the Republican struggle against Franco’s troops united both conflicts in a global crusade against fascism that was admired throughout Europe. This interest was also reflected to a remarkable extent in literature. Between 1890 and 1940 more than 120 books related to China were published in Spain. 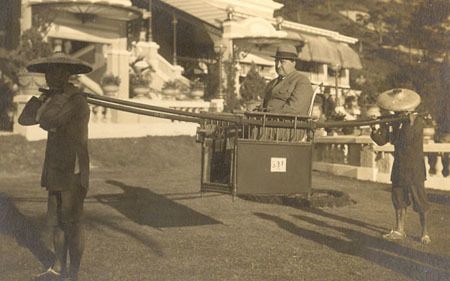 In addition to translations, China became an important source of inspiration for Spanish writers as well: the accounts of the travels of Vicente Blasco Ibáñez in La vuelta al mundo de un novelista (1924) and Federico García Sanchiz in La ciudad milagrosa (1926) were the prelude to other notable works that became highly popular, such as De España al Japón, En el remoto Cipango and El diablo blanco by Luis de Oteyza (1927), Pío Baroja’s Yan-Si-Pao, Pilotos de altura and La estrella del capitán Chimista (1928, 1929,1930), and, in the Catalan language, Joan Crespi’s La ciutat de la por (1930). 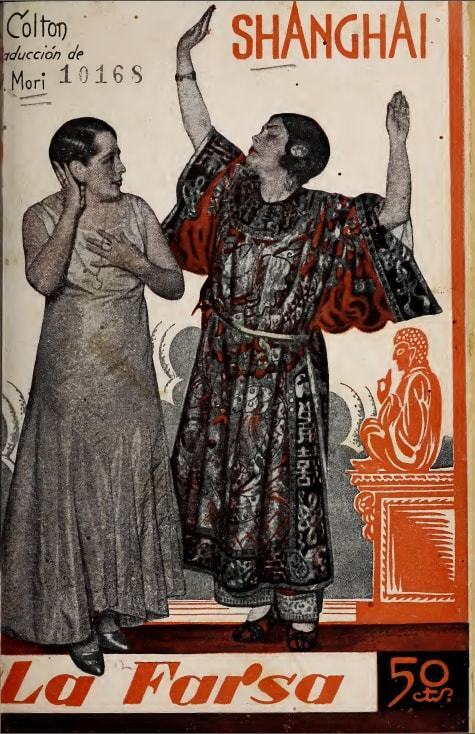 The prestigious journal Revista de Occidente included in its associated book series the volumes Cuentos populares de China and Domador de demonios (1925, 1929). Chinese poetry was used as a source of renovation of the lyrical canon by acclaimed Catalan poets such as Apel·les Mestres, Marià Manent and Josep Carner between 1925 and 1935. Fig. 2. Photograph of Blasco Ibáñez in China. Image courtesy Archivo China España, 1800–1950. But the remarkable interest in China across Spanish society largely did not exploit that unique perspective. The China we find in the mainstream publications in Spain is not that different from the China we find elsewhere in Europe. This can probably be explained by the ways in which this vast knowledge about China reached Spanish readers. Discourses on China arrived into many different European national contexts indirectly, via pivotal centers such as England or France. Scholars in translation studies have recently started analyzing and categorizing indirectness in different ways. In short, an indirect translation can be defined as “any translation based on a source (or sources) which is itself a translation into a language other than the language of the original, or the target language.” This definition can be broadened to the discursive and cultural level. The way China was represented in Spain in the 1920s and 1930s illustrates this phenomenon. In the media, Spanish illustrated magazines had always used sources already published in England or France for their pieces on China. Newspapers, similarly, regularly relied on information released by foreign agencies such as Reuters, United Press, or Havas. Thus news and reports with explicit or implicit colonial interest in China were disseminated in a nation that did not have a colonial relationship with China and which, furthermore, shared many historical predicaments with it. In literature, about 25 percent of the books related to China that were published in Spain between 1900 and 1930 (including poetry, fiction, and non-fiction) were acknowledged translations of English or French originals. The rest generally relied on foreign sources, even if they were not always acknowledged. Works by sinologists and experts on China or East Asia such as L’Abbé Huc (Évariste Régis Huc), Pierre Leroy-Beaulieu, Maurice Courant, Henri Cordier, John Hamilton Gray, Edward Harper Parker, Oliver Josiah Krause, and Chester Holcombe Jr were well known among Spanish cultural elites, even if they were not always translated into Spanish or Catalan. The general effect of this indirect way of translating China—textually and figuratively—was clear: it was impossible to imagine China in Spain without the mediation of these central agents. And this second-hand engagement produced certain gaps and inconsistencies in the intellectual and cultural production. Verdaguer’s impersonation of an English narrative voice was not an isolated case. In 1899, Enrique Bendito, for instance, published the novel Un viaje a Júpiter, a tale of two aristocrats embarking on a trip to Jupiter with a Chinese philosopher. The main characters are Henry Hampill Yorkshire, Duke of Blane, and George Hampill Yorkshire, Duke of Maryland, even if the subtitle makes sure to attest that it was an “obra escrita en español.” In 1930, Joan Crespi published La ciutat de la por, a novel about a young Catalan man who discovers Canton through the guidance of Sir Lawrence Gray, a mysterious Englishman who seems to know everything about the place and who plays a key role as the agent for all actions. The travel accounts by Blasco Ibáñez and García Sanchiz mentioned above show the tensions in dealing with a fundamental problem: how to represent the China they are visiting from a Spanish position that is free from a colonial attachment but still subjected to the hegemonic discourses on China that arrived from Europe. In the case of poetry, the important Catalan poets who wrote about and even undertook translations of Chinese poetry, not only took English and French versions such as Arthur Waley’s and George Soulié de Morant’s as their middle-texts, but as revered references—even more so than the Chinese originals. In the context of Catalan Noucentisme, Chinese poetry represented an avenue towards the European centers of culture. To access China through European go-betweens was also a way of projecting Catalonia’s anxieties towards—and submission to—European modernity and the modern world. Two further examples illuminate these contradictions with particular eloquence. Ortega’s review of The Problem of China is a case in point. Even if, as mentioned, he disagrees with Russell on pacifism and his argument denotes a certain Spanish singularity, he still judges China and Asia exclusively through Russell’s account. Despite all his critical edge, he remains uncritically locked within the representational boundaries traced by his English colleague. Similarly, in “Àsia,” a programmatic piece written for the opening issue of the elitist La Nova Revista in 1927, the Catalan intellectual Joan Sacs displays a very mature view on the East, not based on a dichotomy between two ontologies, but rather on a unity of cultures. At the same time, however, the path towards this ambitious cross-cultural understanding orbits around Euro-American orientalism: “We must, then, leave behind our condition of aerolites and enter the orbit of European orientalism; at least we must try to catch up with the contemporary synopsis of the East, which the most learned Europe and North America have been crafting since long time ago” (Sacs, “Àsia,” 70). The gesture is highly telling: facing the need to learn about the East, Catalan and Spanish intellectuals disregarded direct sources such as Spanish diplomats, businessmen, and travelers and relied on European publications such as Journal Asiatique. This second-hand China was more desirable than the original. Or, probably, it was the only China they could conceive. Such intellectual dependence reveals both the subordinate position of Spain as well as the instrumental use of orientalism and the study of China as a way to catch up with the hegemonic European centers. Transnationalism has been one of the main trends in modernist studies—and in comparative literature in general—in recent decades. The path towards a less Eurocentric modernism has added new local contexts and has read “canonical” works from a new light. A decade ago, Douglas Mao and Rebecca Walkowitz had already summarized this trend in three main features: the inclusion of alternative traditions, the emphasis of translation and transnational circulation in the production of modernist art, and the (disputable) connection between modernism and postcolonialism. This interrelation between translation, transnationalism and postcolonial studies has certainly opened new horizons—the recent development of world literature as a field being one of the most remarkable. Yet it has also shaped reflections on transnational, world, and global issues within a binary pattern that accommodates to the logic of the postcolonial framework. This does not cover the multiplicity of contexts—national, regional, local—that characterize the cross-cultural encounters with the Other, which can, in fact, be quite intricate and should be examined cautiously: while Spain, for instance, held the position of a colonizer vis-à-vis Latin America, it was also subjected to a subordinate, subaltern—perhaps even colonized?—position in the discursive construction of the image of China (and Asia) within Europe. This leads us to at least three considerations about the role of translation, which should illuminate the question I raised at the beginning: Why would a translation have more value than an original work? First, translation contributed to the process of colonization not only in non-Western contexts such as China, but also within the West itself. The examples examined above show how the representations of China in Spain in the 1920s and 1930s were shaped by discourses originally generated in English and French contexts. This reminds us that the creation and dissemination of a certain image of China in Europe shifted across national contexts, agents and languages. The study of translations in this and similar contexts has the potential to unveil the real workings of power underlying cross-cultural circulation at a certain historical moment across different dimensions that must be combined: regional, national, hemispheric. While postcolonial translation scholars have showed the intimate connection between colonialism and translation, a more specific examination is needed to unbind these political readings from the colonizer-colonized dichotomy. Recent studies have showed that indirectness is “a productive concept that stresses hidden dynamics,” even if it remains “overlooked in the study of literary translation” (Marin-Lacarta, “Indirectness,” 134, 135). The examples mentioned above show how this can certainly be a fruitful avenue of inquiry that supplements former scholarship on the role of translation, comparison, and cross-cultural circulation. This dynamic, established in the 1920s and 1930s, has nowadays become fully naturalized in the international literary market. It is not unusual that works of Chinese literature get translated into languages such as Spanish or Catalan either indirectly or, at least, only after they have been published in English or French. Third, as a result, translation and indirectness end up flattening the world literary ecosystem and the plurality of cross-cultural engagements. In part, this is because “the same literary works are being published in different languages and often almost simultaneously” (Marin-Lacarta, “Indirectness,” 145). But it is also because the impact of translation affects discourses about the Other and the way the Other is accepted on a linguistic, formal, and ideological level. If, as Susan Bassnett argues, “translation becomes a means of shaping the alien into textual forms that are acceptable to the target culture,” we must pay attention to how that acceptability is determined (“Postcolonialism And/As Translation,” 349). As we have seen, translation can also disconnect cultures by creating homogeneous representations that are circulated through dominant intermediaries and thus hinders multifaceted connections that could otherwise exist. I thank David Martínez-Robles, Maialen Marín-Lacarta, Gayle Rogers, Josh Miller and the two anonymous reviewers for their valuable comments. This piece was conceived under the framework of the projects “Archivo China España. Un análisis cuantitativo y cualitativo de las interacciones entre España y China (1850-1950) y su impacto en los estudios coloniales e interculturales” (MINECO, HAR2016-79995-P, 2017-2019) and “Sino-Spanish Encounters in Taiwanese and European Archives: 1839–1939” (Chiang Ching-kuo Foundation, 2015–2018). Two recent analyses of this new historical context for understanding and representing China are: Hua Hsu, A Floating Chinaman: Fantasy and Failure across the Pacific (Cambridge, MA: Harvard University Press, 2016) and Richard Jean So, Transpacific Community: America, China, and the Rise and Fall of a Cultural Network (New York: Columbia University Press, 2016). Although they both focus on the US context, many of their points—increased cross-cultural mobility, emergence of new mediators, coexistence of different social perceptions of China, and new media technology involved in these processes—can be extrapolated to other Western contexts. An early text such as My Vacation (Mis vacaciones) by Apel·les Mestres, originally published in 1900, shows the degree of familiarity of the Spanish readers with the Chinese contemporary reality. In this comic strip, Mestres narrates his travels around the world and depicts China in a way that makes it clear that it was part of an international public sphere well-known by his readers. See Apel·les Mestres, Mis vacaciones: Notas de viaje (Barcelona: Imprenta de Salvat e Hijo, 1900). See bibliographic lists at: ALTER Research Group, Archivo China-España 1800–1950. The China-Spain Archive is an open-access digital archive that brings together textual and visual documents on the interactions between Spain and China between the mid-19th and mid-20th century. It is a project created and managed by the research group ALTER at Universitat Oberta de Catalunya (UOC). See Carles Prado-Fonts, “China como patriótico desahogo: usos de la alteridad en los Viajes del chino Dagar-Li-Kao de Fernando Garrido,” Hispanic Review 83, no. 3 (2015): 275–98; Fernando Antón del Olmet, El problema de la China (Madrid: publisher unknown, 1901); Joan Torres-Pou, Asia en la España del siglo XIX: Literatos, viajeros, intelectuales y diplomáticos ante Oriente (Amsterdam: Rodopi, 2013), 59–80; Eugeni d’Ors, La Veu de Catalunya, May 6, 7, 9, 11, 12 and 13, 1914. Republished in Eugeni d’Ors, Glosari 1912–1913–1914 (Barcelona: Quaderns Crema, 2005), 807–16; José Ortega y Gasset, “El Problema de China: Un libro de Bertrand Russell,” Revista de Occidente 3 (September 1923): 157–62; Gaudencio Castrillo, El comercio en el Extremo Oriente (Madrid: Imprenta del asilo de huérfanos del S. C. de Jesús, 1918). I thank Gayle Rogers for bringing Ortega’s review to my attention. For a recent overview see Alexandra Rosa, Hanna Pięta, and Rita Bueno Maia, “Theoretical, Methodological and Terminological Issues Regarding Indirect Translation: An Overview,” Translation Studies 10, no. 2 (2017): 113–32; and Maialen Marin-Lacarta, “Indirectness in Literary Translation: Methodological Possibilities,” Translation Studies 10, no. 2 (2017): 133–49, 134–35. Harald Kittel and Armin Paul Frank, Interculturality and the Historical Study of Literary Translations (Berlin: Eric Schmidt, 1991), 3. This definition is also quoted in Marin-Lacarta, “Indirectness,” 135. See Siwen Ning, “De la China legendaria al declive del Celeste Imperio: La representación de China y su imagen literaria en la España del siglo XIX” (Barcelona: Universidad Autónoma de Barcelona, 2015). See Carles Prado-Fonts, “China and the Politics of Cross-Cultural Representation in Interwar European Fiction,” CLCWeb 19, no. 3 (2017). Data taken from bibliographic lists at Archivo China-España 1800–1950. See Enrique Bendito, Un viaje a Júpiter: Obra escrita en español (Valladolid: Imprenta, Librería y Encuadernación de Jorge Montero, 1899); Joan Crespi, La ciutat de la por (Barcelona: Les Ales Esteses, 1930). See Manel Ollé, “El veïnat xinès i l’exotisme literari,” 452oF 13 (2015): 167–81. See Joan Sacs, “Àsia,” La Nova Cultura 1 (January 1927): 69–75. My translation. See Douglas Mao and Rebecca Walkowitz, “The New Modernist Studies,” PMLA 123, no. 3 (2008): 737–48. See Aamir R. Mufti, Forget English! : Orientalisms and World Literature (Cambridge, MA: Harvard University Press, 2016), 19. The classical works of postcolonial translation theory are: Vicente Rafael, Contracting Colonialism: Translation and Christian Conversion in Tagalog Society Under Early Spanish Rule (Ithaca, NY: Cornell University Press, 1988); Eric Cheyfitz, The Poetics of Imperialism: Translation and Colonization from The Tempest to Tarzan (Oxford: Oxford University Press, 1991); Tejaswini Niranjana, Siting Translation: History, Post-Structuralism, and the Colonial Context (Berkeley: University of California Press, 1992). For an excellent summary of the interrelation between translation studies and postcolonial theory and a survey of more recent contributions, see Susan Bassnett, “Postcolonialism And/As Translation,” in The Oxford Handbook of Postcolonial Studies, ed. Graham Huggan (Oxford: Oxford University Press, 2013), 340–58. Marin-Lacarta’s article appears in a special issue of Translation Studies that testifies to this interest. See for instance: Lydia H. Liu, Translingual Practice: Literature, National Culture, and Translated Modernity—China, 1900–1937 (Stanford, CA: Stanford University Press, 1995); Ying Hu, Tales of Translation: Composing the New Woman in China, 1899–1918 (Stanford, CA: Stanford University Press, 2000); Minor Transnationalism, ed. Françoise Lionnet and Shu-mei Shih (Durham, NC: Duke University Press, 2005); Emily Apter, The Translation Zone: A New Comparative Literature (Princeton, NJ: Princeton University Press, 2006); Bella Brodzki, Can These Bones Live? : Translation, Survival, and Cultural Memory (Stanford, CA: Stanford University Press, 2007); Emily Apter, Against World Literature: On the Politics of Untranslatability (London: Verso, 2013).